The existence of major palaces is evidence for states large enough to require administrative centers, but their number implies that government was largely decentralized. Evans regarded the size of Knossos as proof that its king exercised suzerainty over the whole island. This theory is reinforced by the marked similarity in plan and construction of all the palaces. Yet this implies no more than a common architectural and artistic tradition. The existence of administrative records outside the main center shows that the other palaces had a measure of independence. Some kind of federal organization may have existed. Palaces and luxurious houses imply a king and an aristocracy. 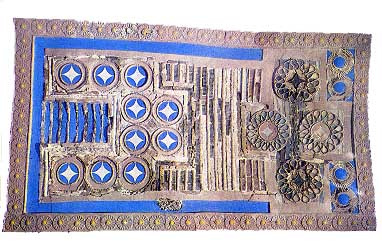 A fresco from Thera depicting a fleet shows high officials in colored robes seated on the deck of the richly decorated flagship. The bulk of the population were obviously employed in agricultural pursuits, and a small class of craftsmen would have been needed to provide luxury goods. 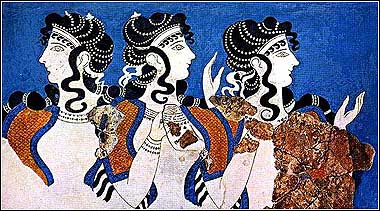 Evidence for overseas contacts comes from the Minoan pottery found in many parts of the eastern Mediterranean.Whether the pottery itself was traded, or only its contents, is not always clear. Some of the decorated vessels can only have been exported for their own value, but trade in olive oil, wine, and perfumes was likely. Crete has poor mineral resources, and metals must have been mainly imported. On the other hand, timber, which is now scarce, may well have been plentiful. Luxury goods such as gold and ivory were imported. It can be proved that the raw material for some of the stone vessels made in Crete was brought from the mainland.